Many businesses find that Just Right Self Storage is a great place to hold business records, or even additional inventory. Our storage centre is a safe, convenient and flexible way to expand your operations without requiring extra space at your premises. Up-size or down-size – we make it easy. Ask yourself the following questions when evaluating your storage needs. How far do you want to travel to access your goods? What are you currently paying for office space? Or to warehouse your inventory? How often, and at what time of day, will you be accessing your goods? Is 24 hour access a valuable feature? Would you benefit from using shelving, which makes your storage space more efficient? What type of goods are you storing? Is mold and mildew a factor? Would you benefit from temperature and humidity control? What are your goods worth to you? Is state-of-the-art security a valuable feature? How will you transport your goods to our building? Is our free truck a valuable feature? Will you need to ship things to your storage unit? Is our free package receiving a valuable feature? Would your sales people prefer to offload your goods in our climate-controlled drive-thru lane? Our salespeople are available to help you to determine your space requirements and select from our products and services. Our self storage centre is a flexible, convenient and safe way to expand and manage your operations without requiring extra office or warehouse space at your premises. You can even expand or downsize your self storage space at any time – we make it easy for you to focus on running your business. Our storage experts are available to help you determine your space requirements and select the products and services that meet the specific requirements of your business. We work diligently to keep your commercial storage safe and provide you with easy access to your storage 24 hours a day 7 days a week. Our state-of-the-art security system and digital video surveillance will provide you with peace of mind knowing that your business storage is safe and secure every minute of every day. Another benefit to storing with us is that we are centrally located in Ottawa which makes your storage more accessible when you need it most. Additionally, you will have access to our climate controlled drive-thru lane to unload your goods into your storage unit. 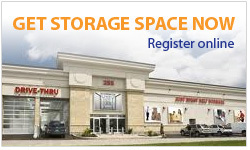 Just Right Self Storage in Ottawa can accommodate all of your commercial and business self storage items. Call us today at 613-567-3333 and speak to one of our commercial self storage experts.